Our father among the saints Gury (+1563) was the first Archbishop of Kazan, and enlightener of Tatarstan's natives. He is commemorated by the church on December 5. Gregory Grigoroevic Rugotin was born in Radonezh to a poor but aristocratic family. He entered the service of Prince Ivan Penkov. After some years he was unjustly accused of having an affair with the wife of the prince, for which he was thrown into prison. It is said that after two years, he was miraculously released one day when his cell was filled with extraordinary light and the door was opened. Upon leaving prison, he joined the monastery of St. Joseph of Volokolamsk, where he was tonsured with the name Gurias. In 1543, he became the abbot (hegumenos) of the monastery. After serving in this capacity until 1552, he left the position and lived for 2 years as a simple monk. He became abbot of the Selizharov Monastery in Tver . In July, 1555, he was chosen to be the first bishop of the new Diocese of Kazan, where he accomplished many missionary activities. He was successful in converting many inhabitants of the region to Orthodoxy, and took special care to build schools and look after the education of children in the Christian faith. Over the course of his eight years as bishop, he labored to build four monasteries, the Annunciation Cathedral of Kazan Kremlin, and many churches. Partly due to ill health from his prison experience, in 1561 Gurius fell seriously ill. Over the next two years, he was unable to stand or walk, and needed to be carried into the church on feast days. 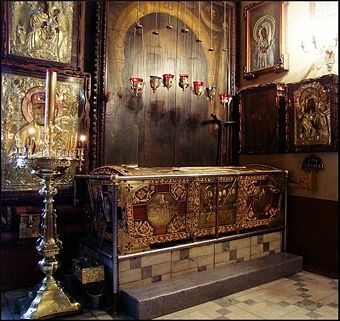 Shortly before his death, he was tonsured into the Great Schema Gurius died on December 5, 1563 and was buried in the Holy Transfiguration Monastery. His relics were found on October 4, 1595. ↑ 1.0 1.1 1.2 St. Gurias, Archbishop of Kazan. Russian Orthodox Cathedral of St. John the Baptist, Washington, DC. ↑ Walsh, Michael J. (July 30, 2007). A New Dictionary of Saints:East and West. Liturgical Press. ISBN 978-0814631867. This page was last edited on October 24, 2012, at 15:03.